Nyomek (right) and some of the organising committee members of the Bung Muan Climbathon with their legal advisor William Ding (second right). 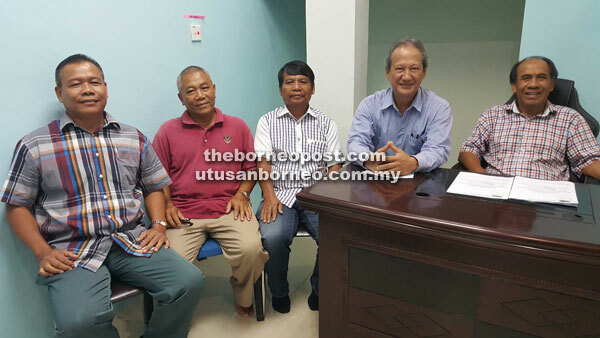 KUCHING: The Persatuan Asal Serumbu Bau (PASB) and Rajah Brooke Heritage (RBH) will jointly organise the Bung Muan Climbathon on May 6. PASB chairman Datuk Peter Nyomek said the event was one of the efforts made by PASB and RBH to promote Buang Muan as a tourist destination. “This will be the first time we organise an event of this kind and if it is successful, we will make in an annual event,” he told The Borneo Post. Bung Muan, a section of Mount Serumbu, is located at Kampung Peninjau Lama, Siniawan, Bau. Mount Serumbu, also known as Mount Peninjau, was home to the earliest settlement of Serumbu Bidayuhs some 300 years ago. While on a working visit to Siniawan and Bau, Sir James Brooke was said to have been captivated by Bidayuh Longhouses at the mountain top facing Siniawan. Between 1848 and 1850 with the help of the villagers there, Brooke built a cottage at Bung Muan located just above the settlement. Nyomek said the climbathon, which would take off from Kampung Peninjau Lama at 7.30am, is divided into four categories – men open, ladies open, men closed and ladies closed. He said the men and ladie open are for participants who are non-residents of Serumbu, aged 18 years old and above. For the open category, participants can either register on May 6 at 7.30am at Balai Raya Kampung Peninjau Lama or obtain the registration forms from PASB office at CL 102, Block 2, Plot 8, Bround Floor Batu Kawa New Township (082-455102) or from Wilson Sipilak at 019-8899707. Registration fee for the open category is RM100 per person. Cash prize of between RM500 and RM100 plus certificate of participation await the top five winners. Nyomek said local dishes, handicrafts and jungle produce will be sold at the competition site that day. “We will also be organising colouring contest for primary school pupils in Serumbu area, giving incentives to students in Serumbu who excel in UPSR, PT3, SPM and STPM as well as launching a book entitled ‘A brief Journey into Serumbu Area’. “Karaoke set will also be available the whole day for those who want to try their talent at singing while in the evening a band featuring dangdut and other numbers will entertain guests until midnight,” he said. Serembu assemblyman Miro Simuh will officiate at the event.